A business shredding solution not only helps to improve efficiency and cost effectiveness but also to cover off essentials such as legal compliance and corporate social responsibility too. It is increasingly viewed as the most attractive solution to waste management and document disposal, no matter what your industry. If you’re investing in business shredding then there are a number of key elements involved in the ideal solution. Business shredding is designed to improve security and so your organisation should be provided with secure, lockable bins by your shredding partner. This will ensure that only those involved in the disposal process can access the contents of the bins and third parties cannot get to the documents inside before they have been shredded. Many of the security and data protection risks that exist arise between the point of collection of waste for disposal and the process of disposal itself. An on-site shredding solution eliminates this risk by ensuring everything is destroyed before it leaves the premises. The longer documents sit around, the higher the risk that they will be interfered with. This is especially so where those documents contain sensitive or confidential data that could compromise the business or the individuals the data belongs to. The GDPR (General Data Protection Regulation) was introduced in May of this year and requires businesses to be much more proactive when it comes to data protection – and data disposal. The penalties for a lack of effective data disposal can be severe under the new regulation. Regularly scheduled collections for shredding can help to avoid compliance issues and fines by ensuring there is never a build up of vulnerable material. To ensure that your business is taking full responsibility for its paper and media waste (and the data within it) it’s important to align these with other office policies. For example, a clear desk policy means that documents are never simply left lying around where they could be accessed by anyone. Direction may be required to help staff identify which documents need confidential disposal and to ensure that the right shredding bins are used – and that they are used correctly. While many people associate shredding with paper, it can also be used to safely dispose of other media too, such as CDs or thumb drives. Your business data is crucial to the ongoing success of your enterprise and so it’s important to make sure that it’s protected by safely disposing of what you no longer need, no matter what format it is in. The ideal shredding solution will also help your business to go greener. 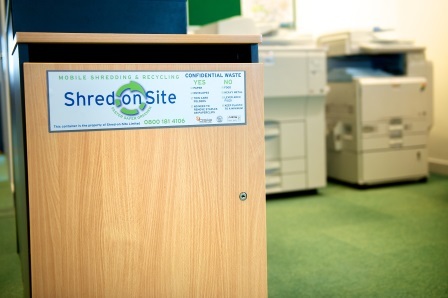 Not only will you be dealing more effectively with office waste but shredding that is recycled will reduce the amount of waste your business sends to landfill and so reduce environmental impact. Shredding is the most effective ways to ensure safe disposal of data in all forms. Contact us to discuss your requirements today.